Spike Jonze (Being John Malkovich) is at first glance, a strange choice of director to bring a much loved children’s book (Maurice Sendak) to the screen. Sam is your average American 8 year old, full of barely suppressed anger, confusion and curiosity with his sister, her friends and his life in general. Mum is busy keeping the money coming in with little time to spare for a very active Max who, not just physically but mentally, takes leaps and bounds, making stories and scenarios up on the spot. There is a very well played scene with Max calming his mother (Catherine Keener) with a short fantastical story she slowly types into the computer as he creates the tale in his head. Sam is played in a very naturalistic way by newcomer (Max Records), each revelation, disappointment and slight played across his face with seemingly no trace of him acting. Falling out with his sister following a snowball fight and then subsequently throwing a tantrum with his mother, who is trying to mildly seduce a new beau (Mark Ruffalo), Max runs away, a very long way away. This part of the movie moves into a fantasy dream sequence where Max stumbles upon a remote island populated by large furry animals who squabble, destroy stuff, playfully fight each other and then fall asleep in a huge mound of bodies at night. Sam enters this world dressed in his “wolf style” white pajamas and is immediately crowned king of the colony. What follows is an exploration of friendship, responsibility, jealousy and perhaps a peek into the mind of a young child starting the first painful steps towards growing up. The animals, notably Carol (James Gandolfini – Voice) and Claire (Pepita Emmerich – Voice) together with their eclectic friends voiced by Paul Dano, Forest Whitaker and Chris Cooper amongst others, are mostly superbly realised without the need for special effects. Although, facial expressions were added using CGI techniques to allow eye and mouth movements to work seamlessly together. 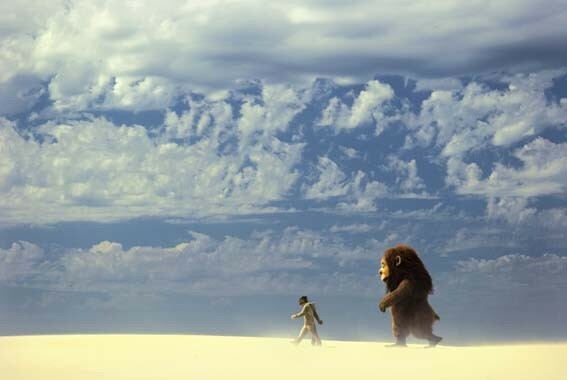 The film provides us with many stunning images of the young Max walking with his large friends through deserts, architectural “playhouse” and gazing out to sea. Equally however, there is the occasional scene where you think, “Hey that’s just an actor/stunt guy in a big fluffy animal suit”, bringing the delicate construct of this fantastical and slight tale into question, leaving the animals looking rather vulnerable and absurd. Of course none of this would matter in a largely picture based book as your imagination fills in the gaps but with a film, such leaps of faith are sometimes harder to make. Are the differing personalities of the creatures reflecting aspects of Sam or are we just reading too much into the story, it is difficult to say. If there is a message and it’s not all too clear there is, perhaps Max has to fit in, think more of others and put his immediate needs and wants behind those of others. If true, that’s not a bad theme but it is somewhat unknown as to who the target audience is, on occasion the film might be too scary for young children and a bit left field for many adults.